Two years ago I couldn’t imagine saying the kinds of things that I say all the time now. Things like “The forage was trampled SOO well today.”, “Honey you should see the way the clover is coming back”, “I think (so and so) is in heat”, “(So and so) is bagging up”, and “Moving the cows is the best!”. All of these are statements that I now say very often. I’m moving the cows every day between 5:00 and 6:00 pm. We’ve got 6 Dexter cows, 6 Dexter calves of all ages, 1 Dexter Bull, and 5 Belted Galloway yearlings. All of these bovines are grazing paddocks each day that are right at 0.14 acres. That’s just over 1/8 of an acre. 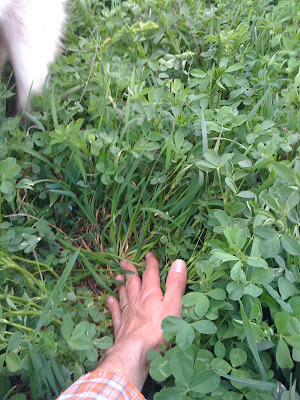 At this time, May 30th, each paddock is starting at knee high and over, of alfalfa, clover (ladino and red), orchard grass, and a little Max Q fescue. There is a small amount of weeds and I’m starting to see crabgrass and some other grasses that I haven’t identified yet. We are now on our second rotation since…. I believe March 27th of this year. This is the date that we let the cows off of their winter paddock by the barn and stopped feeding hay. We did supplement with just a little hay to help them keep from bloating though. When we first started rotating the cows were grazing most of the forage off, after a couple of weeks we were able to get the right paddock size that caused the cows to trample any forage that they didn’t eat. This has been spectacular for the regrowth! 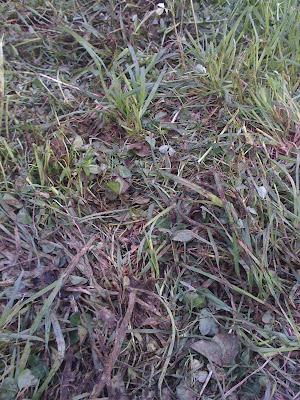 Now, in the second rotation the grass is tall and the cows are continuing to do lots of trampling, now as much as 40 or 50%. If we were grazing existing pasture I might feel bad about all that trampling but we have to keep reminding ourselves that 13 months ago this “pasture” was all dirt! Being crow crop land for 30 years or more, the organic matter was very low and this trampled forage is helping to build soil and create the excellent soil fertility that we desire. It’s amazing to see how long moisture is held in the areas with tall forage and or trampled forage. It’s also great for us to see how soil life is thriving. We see many insects in the fields, worms in the ground, and dung beetles working hard to bury the manure! This is actually really important because the manure (fertilizer) is being moved closer to the plant’s roots, flies aren’t able to reproduce in the cow pies, and holes are left in the ground that help to absorb and store water when it rains. 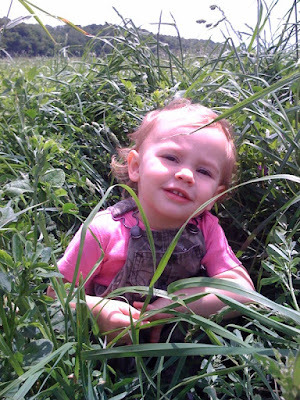 On to some pictures of this years forage. 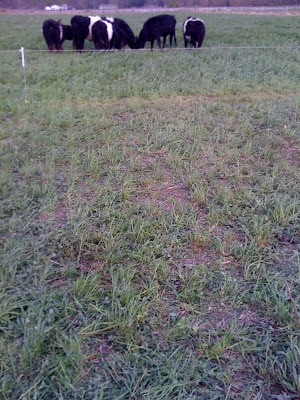 First is a picture of the grasses just starting to grow. We have really bad rows showing because of using a seed drill last year and it was worrisome to me in the beginning that we may have not left enough grass standing last year. Next is a picture from just a little later. This is when we were allowing the herd to graze just a little each day, in preparation for the start of full grazing on the spring lush. These pictures are probably 2 weeks into grazing. Each day the forage residue is a little different but this is a pretty good look at a typical move. The cows are eating tall (first rotation still) spring growth and leaving shorter, damaged forage behind with a high amount of manure deposited. This is probably 2 weeks of rest. The rest period on the first rotation was around 50 days but here is a picture at about 25 days rest. There is really no comparison to how it looks now. This is my little girl sitting right in the middle of the salad bar at about it’s maximum height. I feel that allowing the forage to get tall and mature helps them to develop the root system that will benefit us in the future. Not to mention that our cows are our only tool to manage the farm at this point and they can only eat so fast! Getting back to the thought that I had when starting this post, Moving the cows IS the best. I have such a great time moving the “mini mob” onto new forage each day, taking note of how the last paddock looks, now the new paddock looks, providing water and minerals to the animals, and walking backwards through the field to see how it’s all recovering and what is working the best. We do have an area that was trampled really badly when it got too muddy and it’s really interesting to see how it’s recovering over time too. If in the future we can get away from feeding hay at all, and just rotate cows onto clean salad bars each day, now that would be the ultimate job for me! Do any of you have the same feelings about moving cows, have experience doing Management-Intensive Grazing or mob grazing, or have a similarly gratifying “chore” on the farm? I love comments! 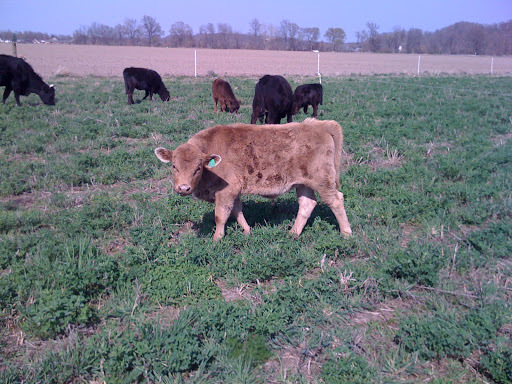 Are you implementing high density “mob” grazing or just “regular” MIG? It is interesting to see how a pasture responds to MiG, but I am always interested in the details and have a few questions. What stocking density (lbs. per acre) does that work out to? How do you plan to include the bermudagrass pasture you planted into the rotation? Devin, it’s good to hear from you and I hope the new little baby is growing well! I am doing my best to implement mob grazing but Salatin says that it’s not really the same with less than 200 head. That’s why I called our herd a mini mob. 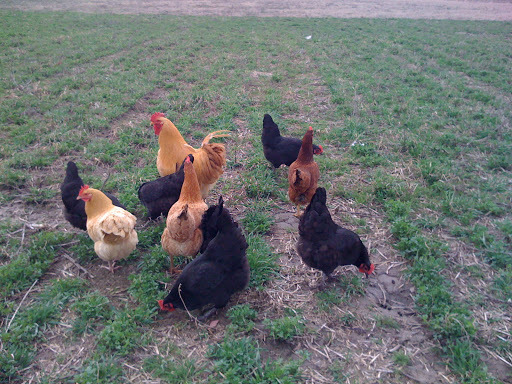 Regular rotational grazing would try to keep the grass between 10 and 4 inches (approx.) and would try to keep in always lush and green… this is what is the difference with what we are doing. As Salatin and Greg Judy have been talking/writing about, the more mature grasses, mixed with new growth tends to balance their diet. I think that Greg Judy has at least 150,000 lbs of bovine / acre and some people get to .5 to 1 million lbs/acre. To answer Rich, I just estimated all of our cow’s weights and added them up and ended up figuring 65,940lbs / acre. I was actually surprised that it was so low and it now makes me wonder if we should try cutting a paddock in half to see what happens. Chris actually mentioned today grazing 1/2 size paddocks for 12 hours so I guess we could go 1/2 size and if it’s too little, we could move them after 12 hours instead of 24 and then go back to the old timing. Anyways….. Good memory Rich, we do have around 2 acres of bermudagrass that is alive.. (that’s a start) Because the bermuda starts growing so late in the spring here, the weeds took over and we had a field of pretty white flowers in early spring. At the end of the first rotation we rotated quickly through the bermuda and the cows ate all of the cool season grasses and weeds and got everything mowed down even and short. It will now be 50+ days before we get back to it. When the time comes, we will decided whether to graze through the bermuda or graze the cool season grasses again. I really want the bermuda to get nice and established before we graze it again because it’s supposed to be hard to establish from seed (we seeded it last summer) and we need it to be thick enough to choke out pig weed, etc. I’ve never been told what yields the renter gets but based on what he pays us it figured to 180 bushels per acre last year (on the adjacent ground). It’s supposed to be very nice “bottom grounds” and was actually swamp land that is kept drained by a network of drainage ditches. Google “Little River Drainage District”. I’ve found journals from my grandpa where he talks about planting crops, pasture, etc. and know from that that he planted hog pastures, pastured some cattle, harvested alot of pecans, and raised crops like corn, beans, black beans, wheat, oats, etc. I love moving cows. It’s one of my favorite things to do. I do it on horseback normally. We’ll move 400 head (mine, and my in laws) all at one time. We gather and herd them. This is the time of year we start it. Week after next we’ll gather and brand. A few days later we’ll start trailing them 70 miles to the mountains. Darned near the best time of the first half of the year. It is a bit of a ride alright. Takes over a week. I just found your blog and have two questions. We have read Greg Judy’s book and want to Ultra High Density graze. We have one Jersey and just acquired 2 dexters yesterday. Our plan is to graze dexters and churro sheep. We had two strands of electric string as our paddock divider-the dexters went right through it. What do you use for paddock changes and for cross fencing in the inside? Also, for the number of cows you have now, how much land are you moving them on before you get back to the beginning? Thanks for the comment. We use one electric polywire with a pigtail post every 60′ or so. This is on 2 sides of the paddock. On the other 2 sides are a single wire of 12.5 ga high tensile and 6 wires (exterior fence) high tensile. We have a pretty big charger that is at around 5400 volts right now. I think that the key is that the cows are trained to the electric. If you have a smallish fence to keep them in you can put at electric wire close to one side and let them touch it. In this situation they will touch it and back away instead of going through it. Once they get shocked good a few times you will be able to put them back in the set up with only 1 or 2 wires of electric polywire. Young calves will go under a 32″ fence until they are older and taller. Sheep will probably always have to have 2-3 wires. You will have a challenge trying to uhdgraze 3 head… the more animals the better. We’re doing it now with about a dozen and it’s working but I can see where it would be better to use 200 :-). Our rotation now is about 50 days or so and we’re using 10 acres. So most of our paddocks are 1/8 of an acre and some get moved through faster at twice or three times that size.